i-Tech is a premier supplier of optical bonding and performance added passive enhancements for all flat panel . i-Tech Optical Bonding process produces an optical bond between any display cover glass or touch panel, and any size LCD. In the world of LCD's, i-Tech takes display enhancement to a new level above all others. Utilizing advanced proprietary optical bonding technology; i-Tech overcomes optical challenges for display product manufacturers at an affordable price. In a wide range of applications, standard liquid crystal appear to "washed out" in high ambient lighting conditions. This wash out is due to excessive reflections and glare caused by bright light. Commercially available LCDs, especially when protected by a separate cover glass or plastic shield, can not deliver enough brightness to make the display functional in outdoors or in other high ambient light applications. The exclusive Optical Bonding process from i-Tech provides a significant reduction of ambient light reflections at an affordable price, compared to other display enhancement technologies. Optical Bonding seals either a top cover glass or touch screen directly to the face of the display bezel. Our bonding process eliminates the air-gap between the display and the cover glass, vastly reducing reflective light, which causes visual washout of the display image. Optical Bonding also enhances structural integrity by supporting the LCD assembly with the cover glass. The bond maintains perfect display uniformity while providing shock protection, unlimted humidity protection, and elimination of fogging caused by trapped moisture accumulating in typical air-gap assemblies. Optical Bonding provides the best reduction of ambient light washout of any commercially available enhancement technology. Optical Bonding has a lower cost than most other competing technologies. Optical Bonding offers superior ruggedization, enhancing the display durability under vibration, shock and other environmental extremes. 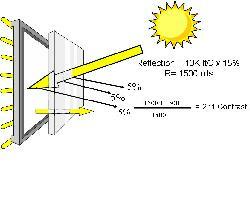 Sunlight viewability of a display depends on the differences between "lumination" and "illumination" of the display. The lumination of the display is its brightness. A display's brightness, typically referred to as a Nit (Candela per meter/2) is the amount of light energy coming out of the display. Illumination is the amount of ambient light shining onto a display. The readability of a display is dependant on the amount of light that is being reflected off of the display. Light travels through a variety of transparent materials; such as air, glass, plastic, and even water. These material's abilty to transmit light is measured by their "indices of refraction". As light transfers from one material to another, such as air to glass, the differences the index of refraction will cause reflection. 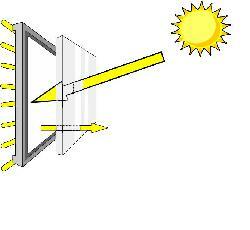 In the case of an air-to-glass interface, the reflection will be slightly less than 5% of the ambient light. All surfaces that have an index mismatch will reflect and the reflection is cumulative. In the case of a standard glass or plastic window, there are three surfaces with an index mismatch which will create a total relfection of nearly 15% of the ambient light. If the total reflection (in nits) is close to the displays brightness, the contrast of the display will be reduced to the point where the display's readabilty is reduced to unacceptable levels. 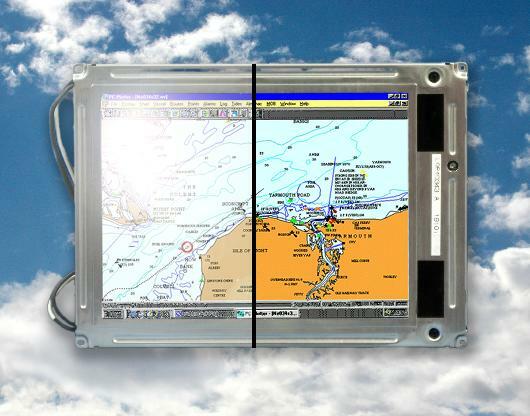 Optical Bonding from i-Tech is a solid, transparent bond which optically couples the front cover glass or touch screen directly to the face of the display. This internal bond eliminates reflection from the two internal layers. The outer surface of the window is treated with anti-reflecting coatings which matches the front surface of the glass with the index of refraction of air. This combination reduces the total reflection of the display and front cover glass to less than 2% of the ambient light. A reduction of reflection of this level, all but eliminates reflective loss in most ambient lighting conditions. With reductions of this level, displays with 300-500 nits of brightness will be viewable in daylight or indirect lighting conditions. At 500-800 nits brightness, most displays will be completely sunlight viewable. Aside from the optical quality, Optical Bonding elminates the air-gap which prevents heat build-up from the "greenhouse" effect and prevents fogging from moisture or contamination from dirt or particles. It also offers shock protection and other damage to the LCD itself. What is Ruggedization Displays Optically Bonded? Optical Bonding 1.1 mm or 3.0 mm AR glass standard lamination "OVER" the display bezel. Lead-time is 3-4 weeks after the receipt of the materials.